A new generation of vehicle-mounted computers – the Honeywell Thor VM1A sets fresh standards when it comes to mobile computing. Wherever goods are on the move, a reliable infrastructure of mobile devices is essential. Honeywell provides the hardware and, by means of the Mobility Edge platform, combines it with advanced software solutions, integrating mobile devices throughout the enterprise. The Thor VM1A by Honeywell is a robust computer terminal that can be integrated into fork lifts or other industrial vehicles. It is equipped with a powerful Qualcomm processor, an 8-inch touchscreen and keypad for convenient operation. The Smart Dock enables quick attachment and removal of the device. It is based on the Android operating system to ensure a future-proof investment and uncomplicated use. 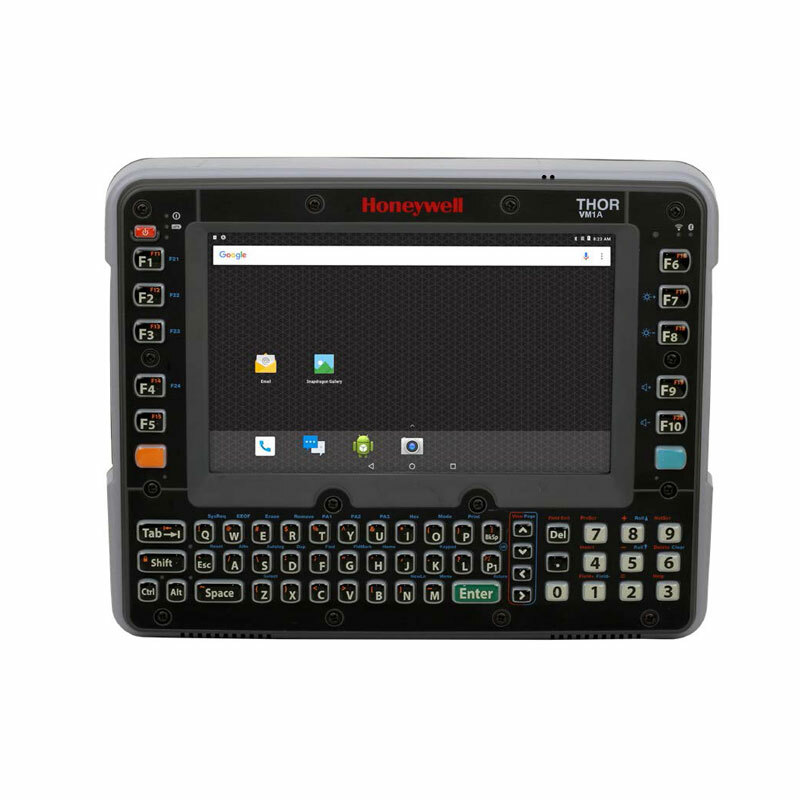 Enhance productivity through improved working procedures in the warehousing, manufacturing or transportation and logistics sector with the new high-performance Honeywell Thor VM1A in-vehicle computer. The Honeywell Thor VM1A excels with a robust construction to suit rough environments. For cold storage or freezer areas, an optional screen defroster is available so that the computer can withstand temperatures as low as -30 °C. The device can easily be switched between vehicles by simply clicking it on or taking it off the Smart Dock. This ensures effective use of the mobile computer. It is sealed against the ingress of dust and water according to protection class IP66. In order to keep maintenance costs low, the operating panel, which is particularly subjected to wear and tear, can be exchanged on site if required. Equipped with a strong 2.2 GHz Qualcomm Snapdragon 660 octa-core CPU, the Honeywell Thor VM1A enables fast and reliable data processing. 32 GB Flash storage can be extended by up to 512 GB via microSD card. The Android operating system is a future-proof solution for enterprise-level mobile computing ensuring support through to Android R. Honeywell’s Mobility Edge platform, creates a seamless hardware and software structure that provides a holistic, replicable and flexible concept for all mobile devices across the enterprise. As a result, Android-based computers can be easily setup, operated and centrally managed. 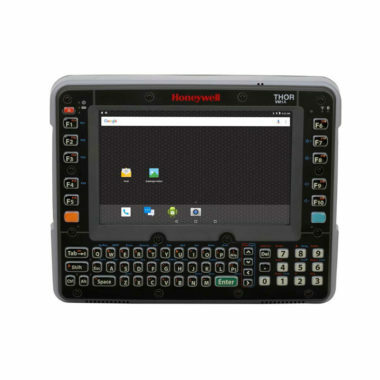 The Thor VM1A vehicle-mounted computer by Honeywell guarantees convenient use by providing an 8-inch touchscreen, either with industrial touch panel or with PCAP multi-touch panel enabling operation even if it is wet or with gloves. The display comes with a brightness of 400 nits as standard and there is an option with 800 nits brightness available as well, suitable for work in environments with bright ambient light. Additionally, the Thor VM1A is equipped with a 64-key backlit keypad with 10 or 20 function buttons. For mobile work, dependable wireless connectivity is essential. This is why the Honeywell Thor VM1A vehicle computer provides IEEE 802.11 a/b/g/n/ac WiFi and 2 x dual MIMO antenna connectors, ensuring improved connection quality with interference suppression and optimized reception as well as higher transmission rates. The powerful in-vehicle device also comes with Bluetooth v5.0 Class 1.5 and BLE and is NFC enabled. To preserve the vehicle battery, the Thor VM1A vehicle-mounted computer by Honeywell has an ignition control feature for smart power management. The Uninterruptible Power Supply can bridge up to 30 minutes which ensures complete reliability and prevents the loss of data. The Thor VM1A is compatible with the VM series’ accessories.